Saratoga sophomore Alicia Follmar, shown crossing the finish line first at CCS, was 13th in the state meet last weekend. Alicia Follmar has a couple of shots left at the California Interscholastic Federation cross country finals. After all, she is just a sophomore at Saratoga this year. But even if she never again makes the trip to Fresno, she can look back with pride on her successful sophomore season—because the young Falcon finished in the top 15 in the Division 3 field at the state meet on Nov. 30 at Woodward Park in Fresno. Follmar covered the 3.1-mile course in 18:53 to finish 13th in the division. The Saratoga sensation ended up in a pack at the finish line. Only 13 seconds separated 10th-place Molly O'Toole of University High School of San Diego (18:47) from 20th-place Raquel Barrientos of San Lorenzo Valley High (19:00). Within that 13-second span, 11 runners crossed the line, and among them was Follmar. Running under overcast skies on the Saturday after Thanksgiving, Follmar averaged 6:05 a mile to finish 13th in the division. 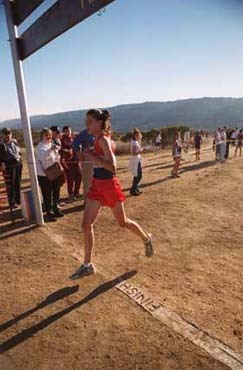 She was just three seconds behind 12th-place Cristina Sanchez of St. Francis of Sacramento and only a second ahead of 14th-place Maureen Huber of Acalanes. Follmar, the sixth sophomore finisher in the division, was 72nd overall in the state, and she finished sixth among runners from the Central Coast Section (CCS). Junior Melissa Grelli of Presentation, first in Division 3, was the top CCS finisher in 17:58.5. Sophomore Ciara Viehweg of St. Ignatius was second, with senior Michelle Gallagher third, sophomore McKayla Plank of Mitty fourth, senior Cherie McPherson of Silver Creek fifth and Follmar sixth. Lynbrook, meanwhile, sent a girls team to the state meet, and the Vikings ran to a team 22nd in the rugged Division 2 field. Junior Aya Wakabayashi led the Vikes by finishing 79th in 20:08. Freshman Zohreh Akhavan was 94th in 20:27, with senior Francine Lee 114th in 20:55. Kate Bossange (128), Sasoon Kim (134), Christina Liao (138) and Agnieszka Goslicka (152) were other Lynbrook finishers. Wakabayashi was 33rd among CCS finishers, with Akhavan 44th and Lee 59th. It was a solid finish for the Vikings and also a strong finish for Saratoga's Follmar. Follmar, running against the best competitors in the state, finished 13th in her division. And as for her never making another trip to Fresno—don't bet against her.